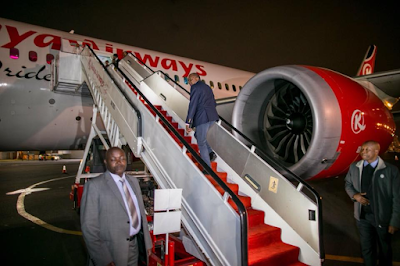 Saturday August 25, 2018 - President Uhuru Kenyatta left the country for Washington DC on Saturday morning ahead of his meeting with President Donald Trump on Monday. The plane carrying the Head of state and his delegation left Jomo Kenyatta International Airport shortly after 1am and Deputy President William Ruto and Interior Coordination Cabinet Secretary, Fred Matiangi, were among the people who saw off the President. Conspicuously missing from President Uhuru Kenyatta's flight was Uhuru‘s Personal Assistant, Jomo Gecaga. Gecaga was at the airport but the President refused to go with him to the United States. Sources said Uhuru is angry with Gecaga after he demanded a Sh 100 million bribe from Kenyatta’s friend to help him win a Government tender. Last week, Jomo Gecaga was detained at a cell within State House where he was forced to return the money to the businessman who has close connections to the First Family. 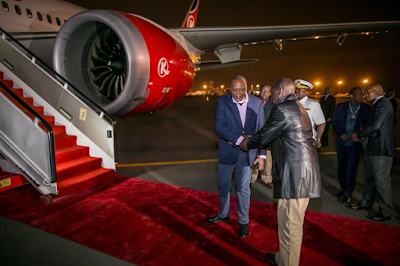 Here are photos of Gecaga being left stranded at the Airport as Uhuru left to the United States. that is just pr: did he do the same to his sister and that one at the kiss for looting 5 billions and 1.5 billions respectively. The opposite is true - it's their time to eat cos that's been their DNS and IQs.